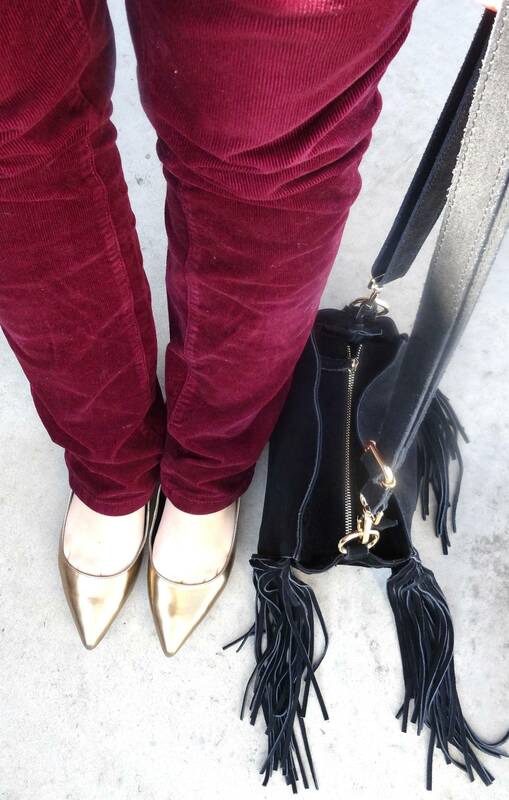 Then and Now: Burgundy Corduroy Pants. Good morning everyone. I feel like I have been slacking in outfit posts in the last few weeks. Last week for example I didn't photograph any of my outfits. I went to work 3 days and also was out and about a couple of times. But between limited time and a lot of chilly weather and cold rain, I wasn't in the mood for a personal photo-shoot. And I have had a week of headaches and migraines. =( I still have some outfits that I have worn and photographed in the last few weeks (like today's) and I plan on shooting several more this week so not to worry. 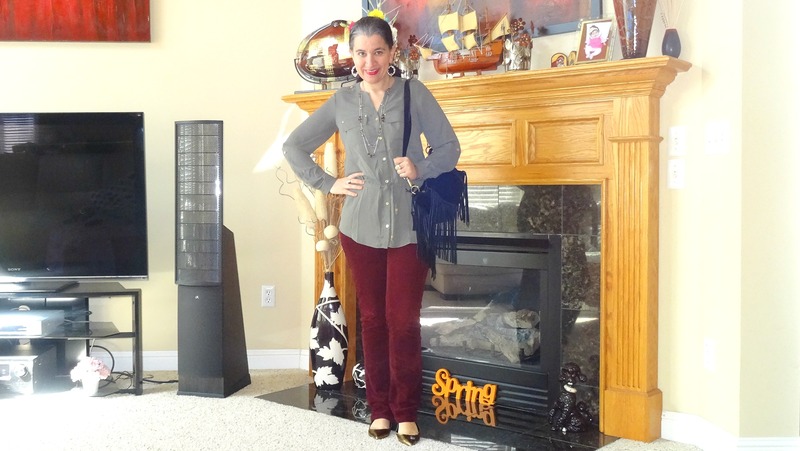 Today, I am showing you an outfit featuring my Burgundy Corduroy Pants and a new Olive Utility Blouse. 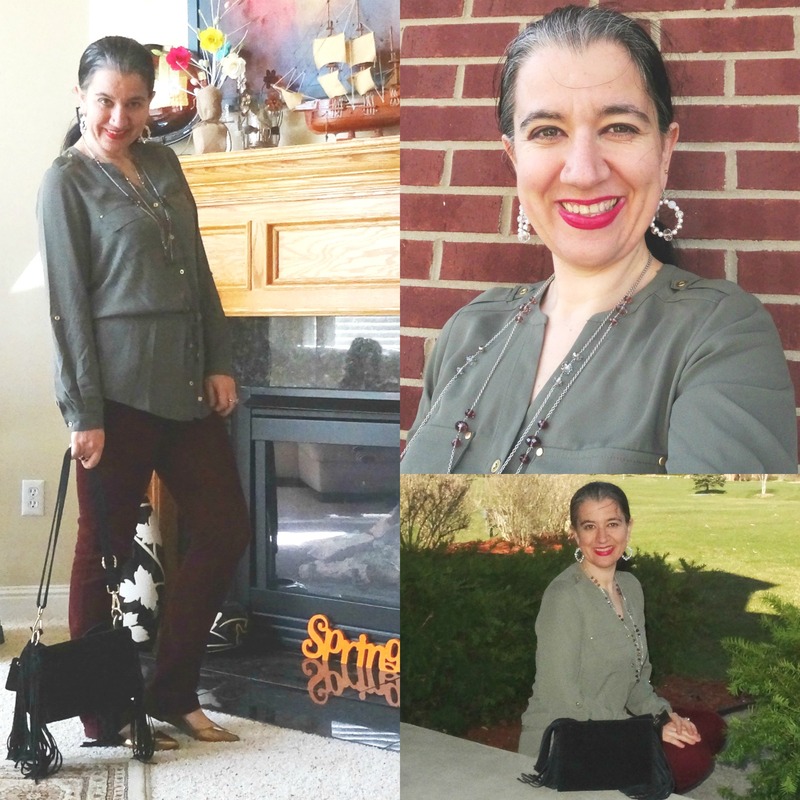 I thought it was fun to do a Then & Now post, since I have styled these pants for cool Spring days before. Actually the outfit on the left (on the collage above) is almost taken exactly 4 years ago as opposed to the one on the right. Both outfits were worn to work. 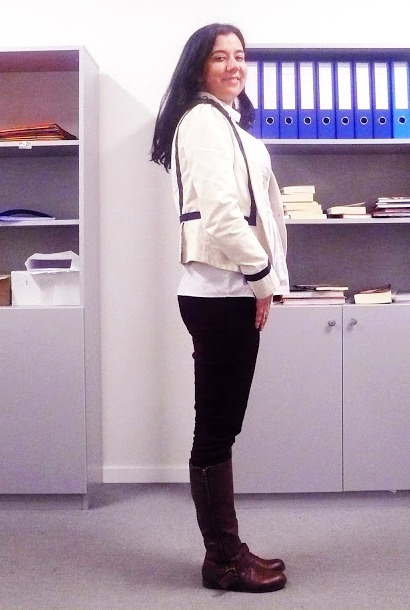 Back then I styled the pants a little equestrian and chic-street, with the olive cords tucked into my boots and an empire-waist pinstripe blouse on top with a white denim blazer. In addition some simple jewelry. 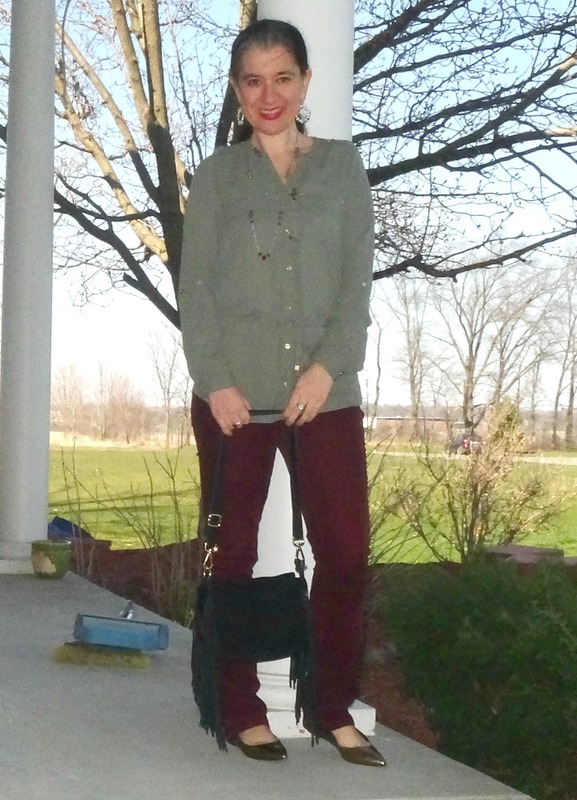 These pants have been in my closet for over 5 years now and I have worn them plenty of times and blogged them several times, too. They are my favorite cords. I love how they feel and also their rich wine color. 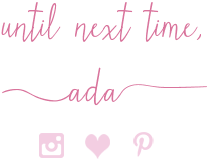 They are by White House Black Market - a favorite brand of mine. 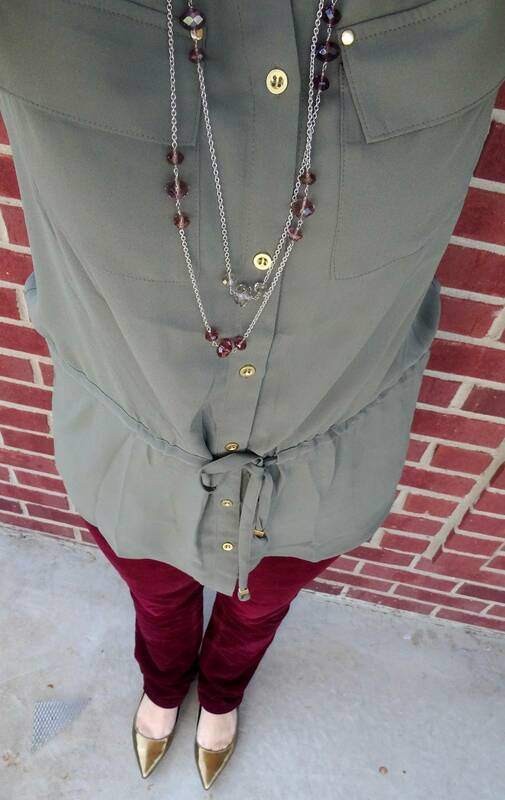 I am not sure I have paired burgundy with olive before but I tell you what - I love the color combination. 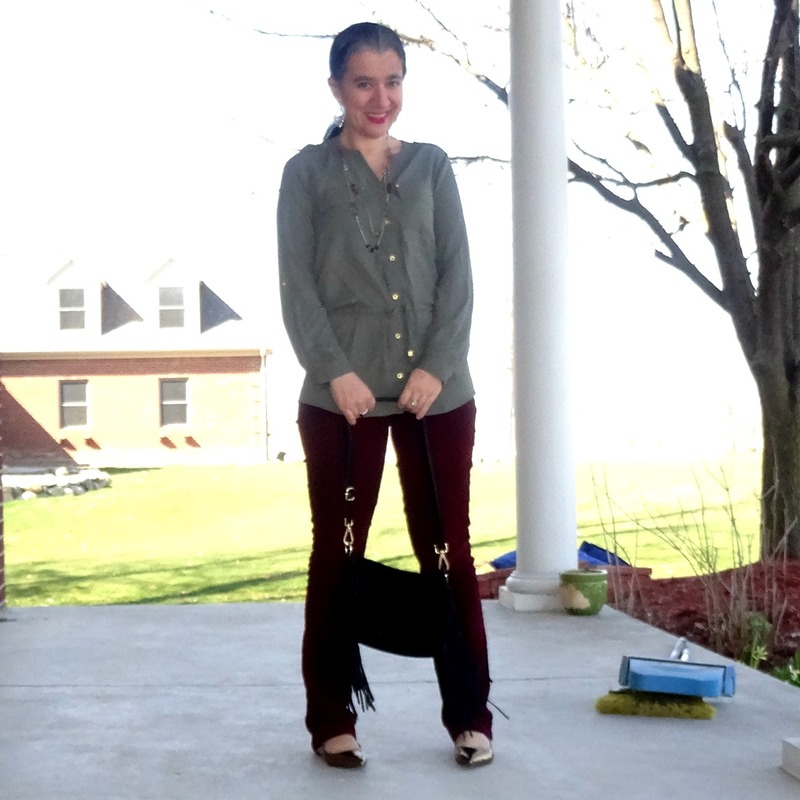 Though the colors are more Fall than Spring, I still think this outfit is quite Springy especially paired with some Ballet Flats like I did here. 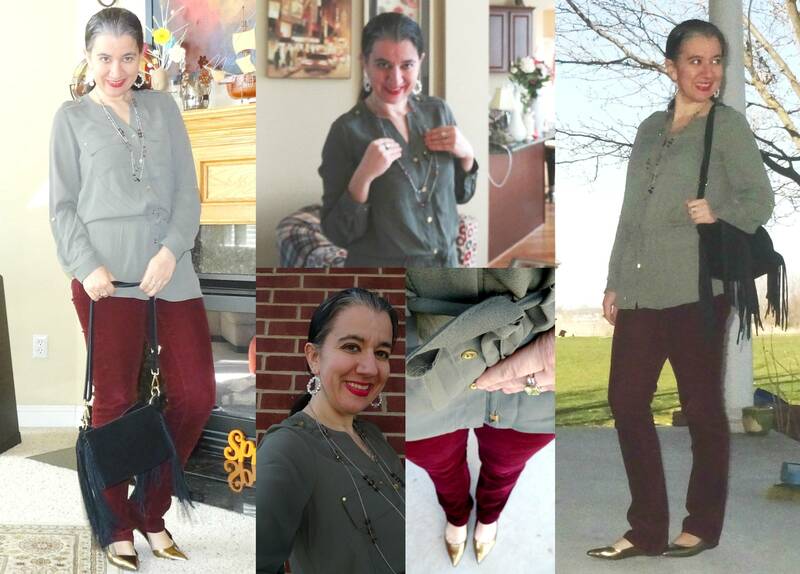 I remember how nice the Burgundy Pants paired with my Camel Boots so I went for similar-colored shoes and chose these Bronze Pointy Flats from Gap. 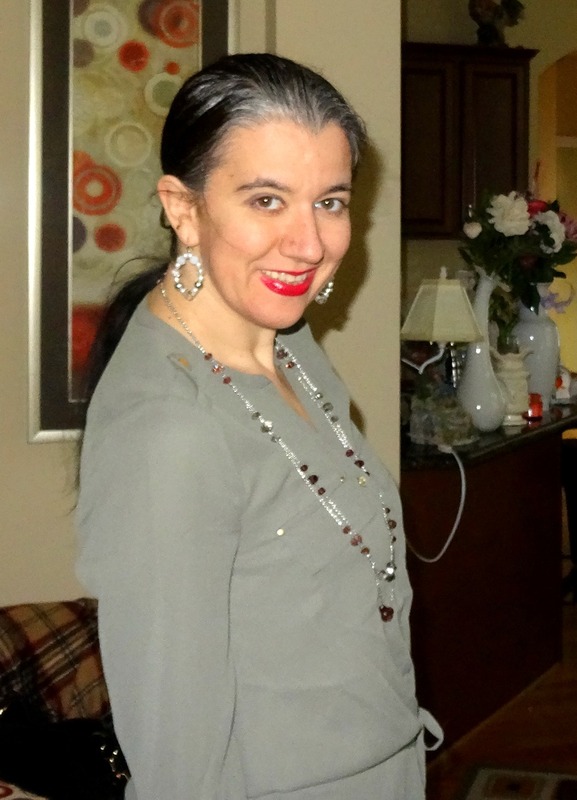 This is one of the new Blouses I have recently bought at The Limited. I bought some gorgeous blouses there lately. 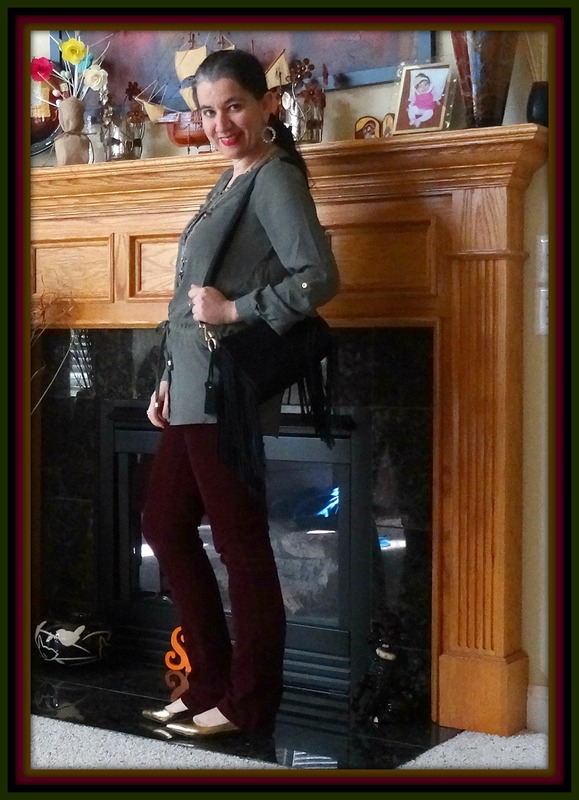 I love the tunic length on this one, the drawstring waist which gives it more of a shape and the military/utility style. It has cargo pockets in the front on the chest and the buttons are in a gold metallic. Also the sleeves are adjustable and can be rolled up. The blouse does run big. I could have gone with a small I guess (I didn't try it at the store) but ultimately chose an XS (what I am wearing). 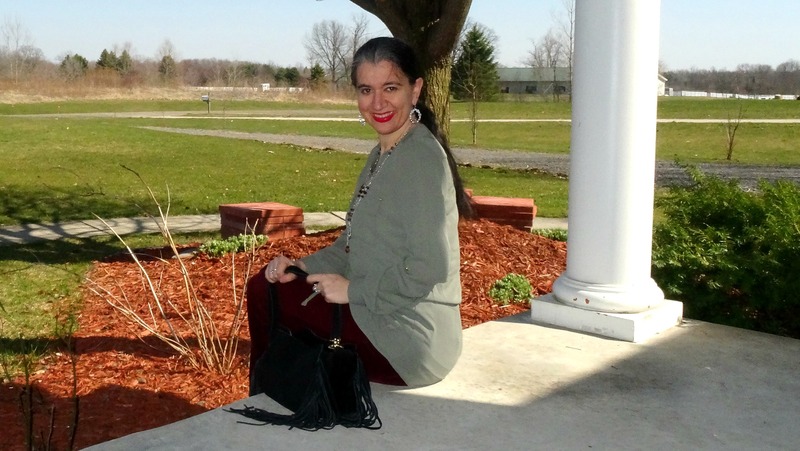 I grabbed my New Black Fringe Bag from Target and added some Beaded Crystal Jewelry and I was done. 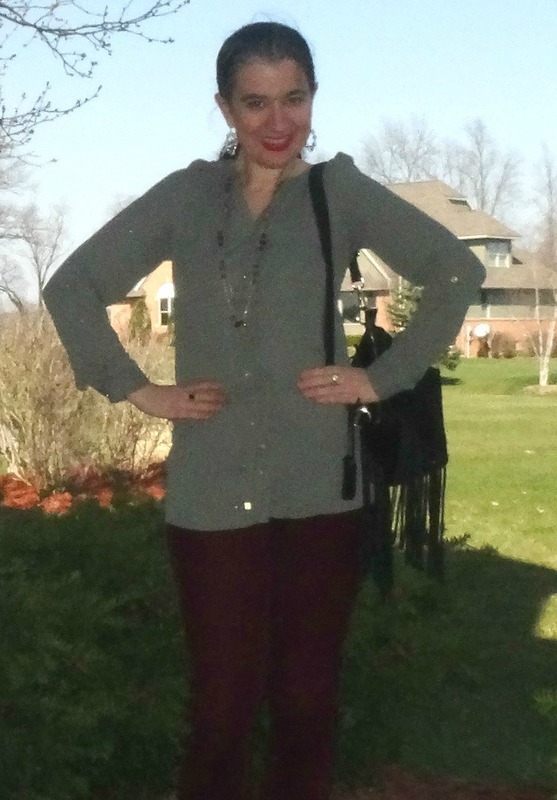 To be noted - the clear purple beads from the necklace go so well with the burgundy pants. 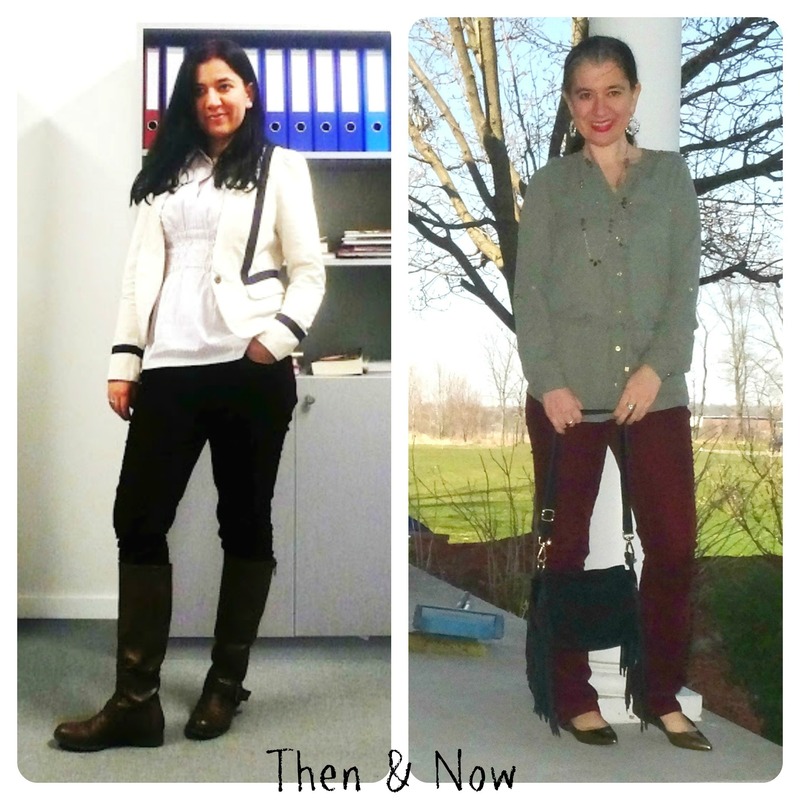 What do you think of my Then and Now look and would you like to see more posts like this? 3/4-Sleeve, Babydoll, Pinstripe White w/ Baby Pink, Poplin Shirt: NY&Co (New York & Company) (casual option), (similar, Splurge). Off-White Denim, Collarless Blazer w/ Navy Trim: LOFT (similar, love this), (draped option, Splurge). 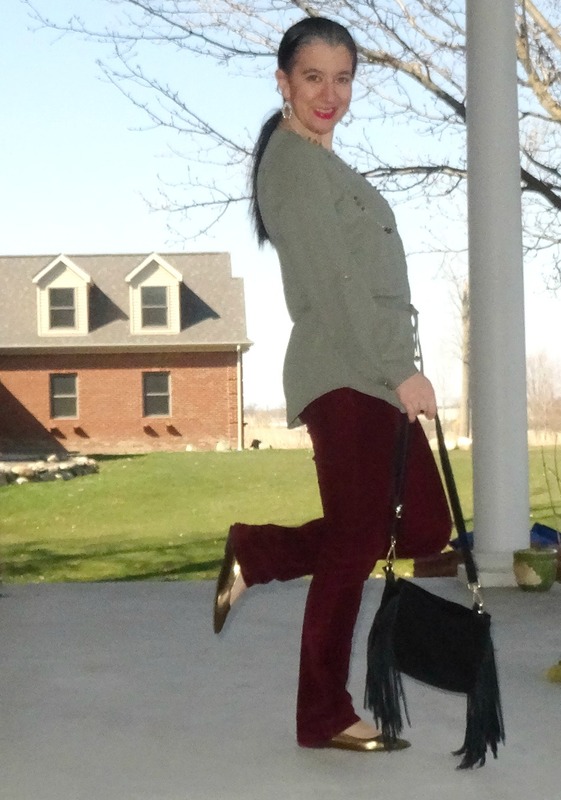 Burgundy Corduroy Skinny Pants: White House Black Market (similar, Steal), (flared style, Great Deal, love these), (similar, small Splurge). Mini Sea Pearl, Stud Earrings: Fred's Jewelry (similar, Great Deal), (similar, Splurge). 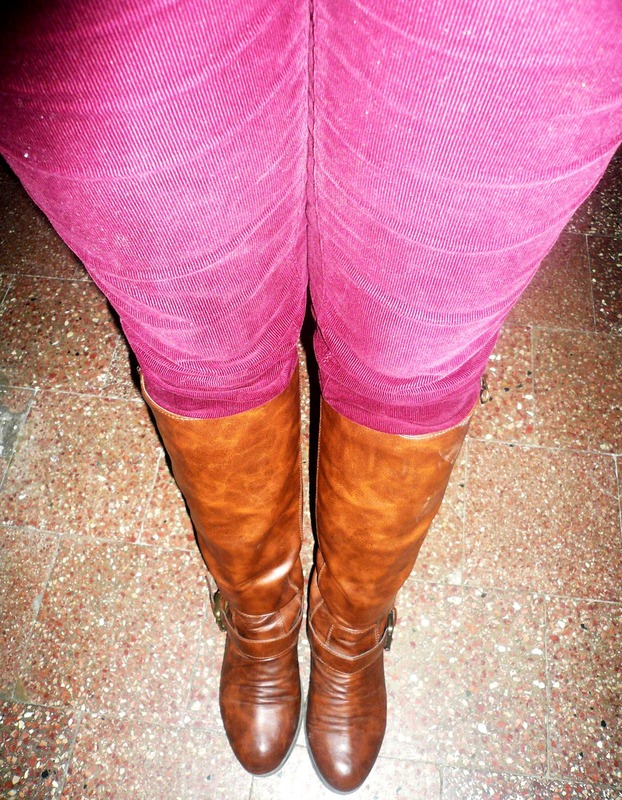 Cognac Brown, Leather, Riding Boots: Payless (similar, Steal, love these), (similar, Great Deal), (similar, Splurge). 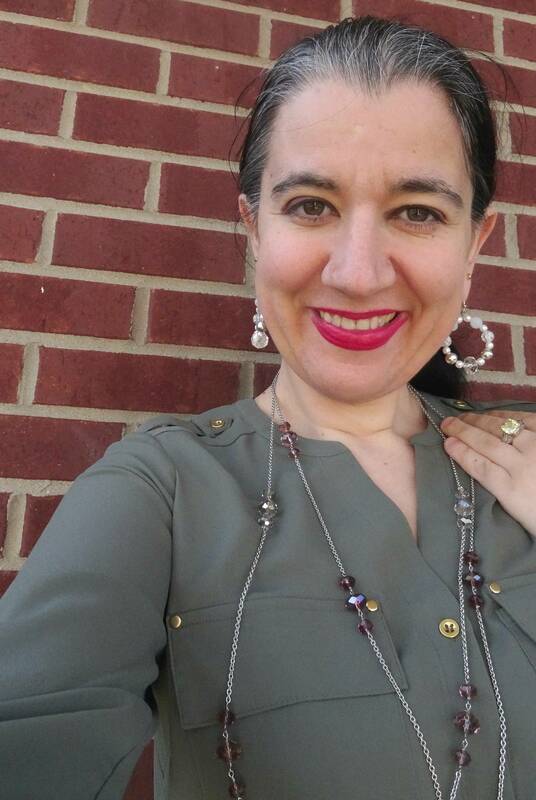 Olive Green Utility, Tunic Blouse w/ Long Roll Tab Sleeves: The Limited (New) (similar, Steal), (similar, Great Deal, love this), (very similar, Splurge). 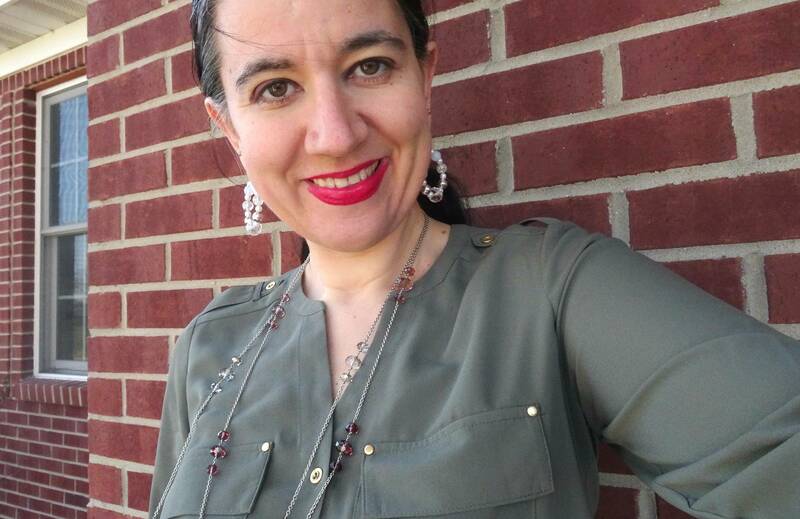 Double-stranded, Silver-tone Chain Long Necklace w/ See-Through Clear & Purple Beads: The Limited (similar, Steal), (similar, Great Deal), (similar, small Splurge). Bronze Metallic Patent Leather Pointy Ballet Flats w/ Ankle Strap: Gap (New) (identical, Steal), (similar, Great Deal, love these), (similar, Splurge). 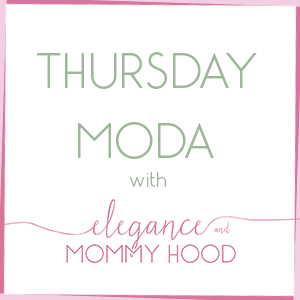 Jalynn, Katherine, Lauren, Leeanne, Linda, Lindsey, Lisa, Liz, Madeline, Monica, Nicole, Rebecca, Sarah, Michelle with Regina, Mix+Match Fashion, Mix it Monday, Stephanie with Jessica, Michelle + Whitney, Tara, Vicki, Victoria and Whitney.